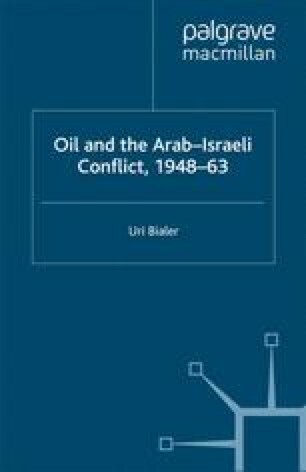 It will be recalled that from the very beginning, and in spite of the mood of the times, Israel rejected the option of nationalizing the Haifa refineries, and had preferred, for various reasons, to move into the oil sector gradually. This policy enabled it to acquire invaluable know-how of the oil business while still benefiting from the presence in the country of the foreign oil companies. The success in making independent oil deals with the USSR, in purchasing Iranian crude oil, in expanding the activities of Delek without running the risks of antagonizing the oil companies attested to the soundness of the basic strategy devised in Jerusalem shortly after independence.1 However, decisions taken by the oil companies in 1954, 1956 and 1957 and by the USSR in 1956 changed altogether the rules of the game and forced Israeli policy-makers to enter the international oil labyrinth alone much earlier than had been envisaged. This chapter will describe the factors that underlay this process during these years.